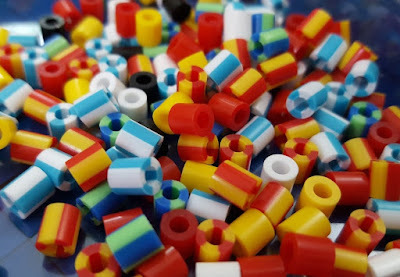 The Brick Castle: Striped Hama Beads Review and Bundle Giveaway! I've been a parent for the last 22 years and yet have only just had my first personal experience of using Hama. Small beads which you can form into pictures using pegboards, and then iron to keep your creation forever. 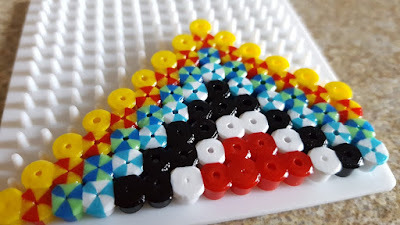 We've had Hama creations in our house for years, but my youngest 2 boys hadn't used them until we were sent a bundle of Hama Beads to review...including lots of the new Striped Hama Beads. 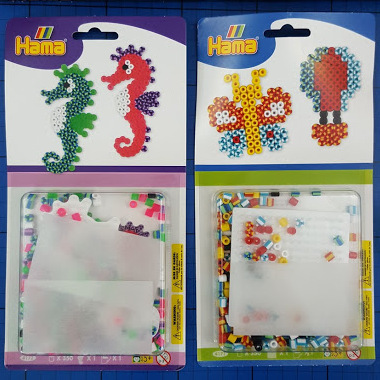 In the bundle we have 5 different items, all with the Midi size Hama Beads, which are suitable for children aged around 5+. Hama Beads Car Set (currently around £10.50). 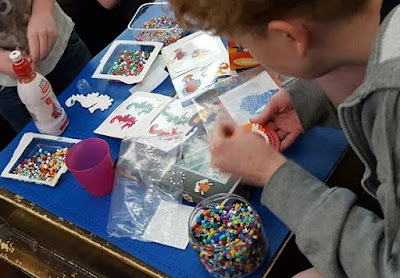 3000 beads, 4 pegboards, design sheet and ironing paper. 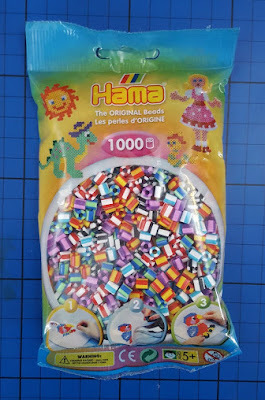 Hama 1000 Multi-Colour Striped Beads (currently around £3.50). Hama Small Striped Bead Kits (currently around £2.99 each). 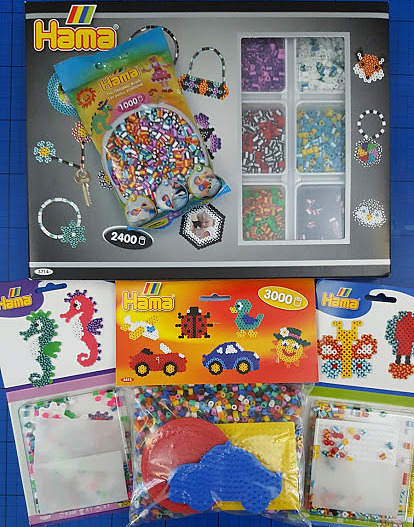 We were sent the Seahorse and Butterfly packs, but there are absolutely loads of different choices available. 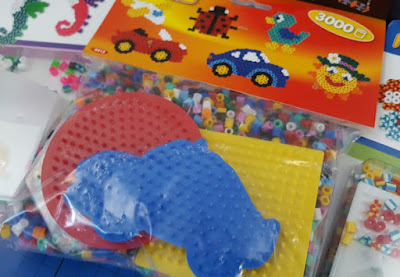 Each contains 450 beads, a pegboard and ironing sheet. Hama Striped Beads Activity Box (currently around £14.99). 2400 beads, including new striped beads, 2 peg boards, a long length of elastic, ironing paper and design sheet. 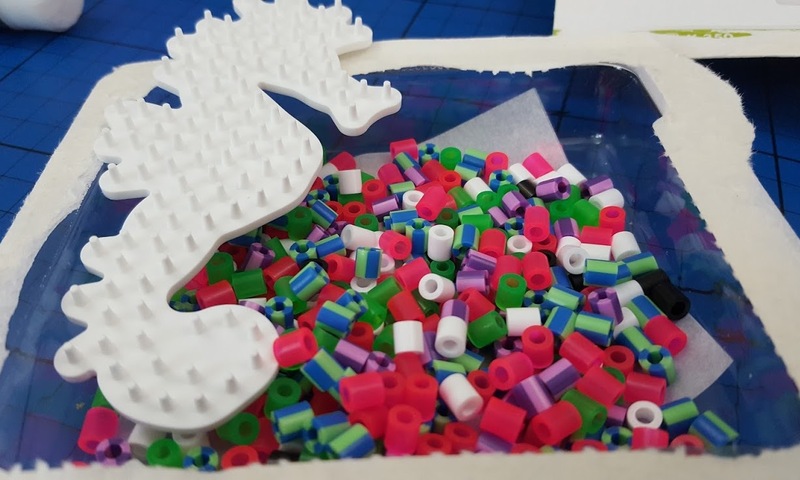 This is a neat box with a thick plastic lid and moulded base which can be used for storage of your beads and accessories. 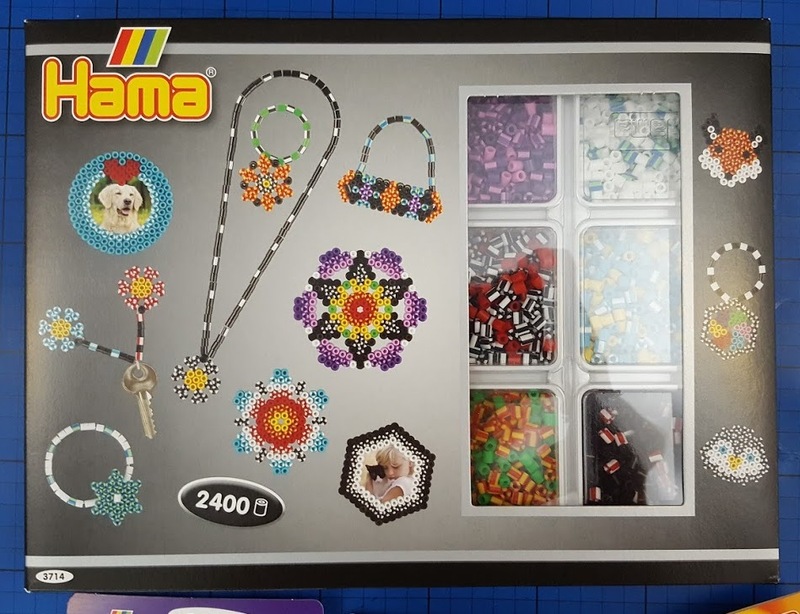 This set encourages you to use the beads for more than just 2D images - jewellery, key fobs and all kinds of ideas are included in the design booklet. If didn't take long for my family to become interested in the Hama Beads. They were opened as soon as on the table, and actually it was 6 year old who made the first creation. He was obviously experimenting, didn't follow any designs and was very happy with what he made. We ironed his patterned tile, and I made sure the beads were well fused. It only took a minute or so with a medium iron, being careful to use the ironing paper - if you catch the beads directly then they immediately stick to the iron, plus burn a sooty dark mark onto the beads. Obviously when you remove the fused Hama it comes away as one, and I am pleased to say it has done every time. It's actually more rubbery in texture than I remember (or the recipe has possibly altered), and the finished designs are very tactile. 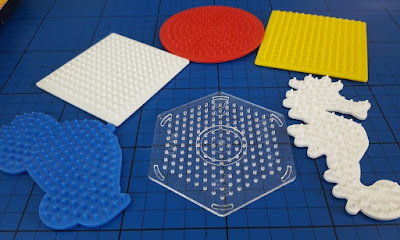 What shape design you make does depend on the pegboard, but there are masses available, and the larger shapes allow for you to create your own designs within them. The new striped Hama beads are very striking, and really add a lot to your finished designs. I love that the variations between colours and types of beads can be used subtly to blend, or boldly to contrast. We've all really enjoyed using the Hama Beads, and no doubt if you follow me on Instagram then I'll be showing some more of our creations using Hama, but a quick Google search brings up millions of designs to copy for the less daring. Hama Beads are available in all good craft stores, and online on Amazon, and via the Hama Bead website, where you can find out more about Hama. For your chance to win, enter using the Gleam form below. No entry is mandatory, but each extra task completed will earn entries into the random draw. The giveaway is open to UK entrants only, and will end at midnight Sunday 17th July. Full terms and conditions are at the bottom of the Gleam form. I'd do the seahorse in the purple stripy beads and white. The pink/purple ones. 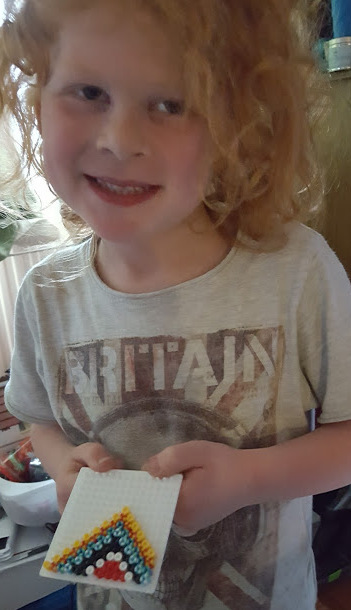 We've just had our first Hama experience at home too. I bought Monkey a vehicles set for his birthday and we finally got round to opening it on Monday and trying it out. He loves it so fingers crossed on this one! Rainbow coloured to make it extra colourful! I think I would do pink, purple and blue all together! I suspect the youngest would choose the first thing she lays her hands on despite my suggestions for simple colours such as green and white. I would love to make my sea horse with purple and white beads. Purple's my favourite colour, but also maybe black and pink, make it a bit of a goth seahorse! I would use stripy purple! I would make a blue and green one. These are fab! Blue and purple seahorse for me! 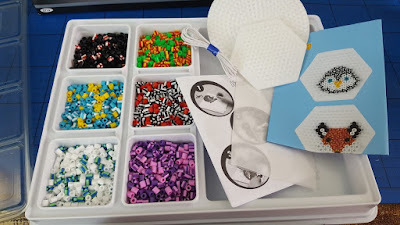 Another tip for using Hama beads is that if the ironing paper provided becomes torn etc and can no longer be used, use baking paper- it does the same job. 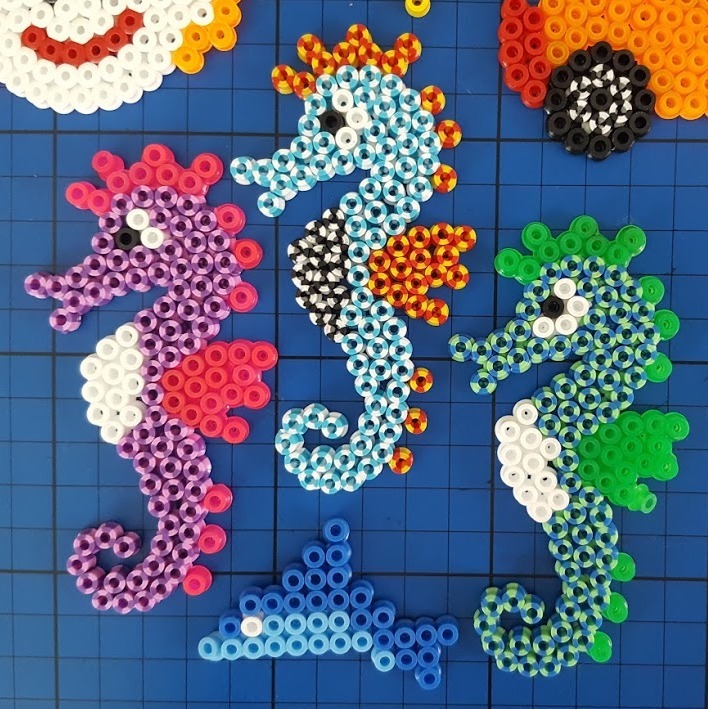 I would make my seashorse from a variety of colours, including the lilac striped beads, the green striped beads, and the blue striped beads, with a little bit of white in for contrast.